I've had a fascination with hotels since the first time I stayed in one at age 2. Something about staying somewhere so luxurious and carefree still resonates with me to this day. When I was younger, my dad travelled a lot locally for work and as a result, stayed in a lot of different hotels. This picture is of a note my dad brought back for me when I was 3. I was so happy when I realized that I had saved this sentimental heirloom all this time, almost 20 years. I was a spastic kid so my dad had a lot of funny nicknames for me. That's me, about 8 years old. Obviously I didn't take this picture but I always liked it. 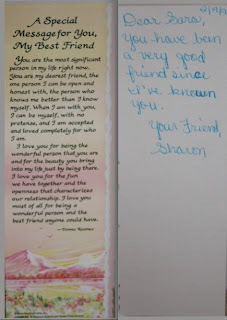 A sweet (albeit cheesy) friendship bookmark my best friend gave me in 5th or 6th grade. The note on the back is so cute. A card I bought awhile back just because it reminds me of me and my 3 sisters. We used to have a larger version of these elephant figurines from Pakistan when I was much younger. On my last trip back, I had to buy these because they reminded me so much of my childhood.